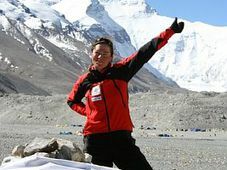 Little over a month ago Klara Polackova was on top of the world, literally, as she became the first Czech woman to ever reach the peak of the world's highest mountain, Mount Everest. Klara, who is 28, is now back home in Prague, and told me all about her incredible experience when we met the other day at a city centre café; but first she spoke a little about her background. "I was born in Prague, right by the river actually. That's my home city, but for the last four years I've been living in London, in the UK...I'm coming back home again now and trying to settle down again." "That was a mixture. I started in an advertising agency, and after a while, when you get tired of that environment and you need a change and a bit of a professional change, I started to work for the Department for Constitutional Affairs, and then for the Ministry of Health." "I think it's more when did I first get into the mountains, which is my first sport and my great love...when I was small my parents took me to the mountains in the Czech Republic, and then we started to go skiing more towards the Alps. You start to discover higher peaks a bit. "About the climbing, that came more about five years ago when I met a group of guys who were really crazy about this stuff and they started taking me up with them. I just joined in and it just grabbed me completely." How did you first get the idea of climbing Everest? "Everest came last year only. I had been climbing another 8000-metre peak in the Himalayas, Cho Oyu - which is 8,200 metres. I met a great guide there, Tashi Tenzing. He was guiding us up to the peak and we became really good friends. "After that climb together we got back to Katmandu and on this beautiful café on top of the roof we were just thinking, what next? Once you have climbed 8,000 metres for the first time and you succeed you think, OK, let's try a little higher. And then the offer came from Tashi - have you ever thought of giving Everest a go? That's where it came from at first and that's where it started." To digress for a second, your guide had a famous grandfather, I believe. 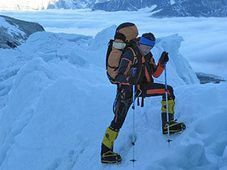 "True - he's the grandson of Tensing Norgay, who climbed in 1953 with Sir Edmund Hillary, the first conquest of Everest. So climbing is truly in his family, for sure." What about the training and the preparations for climbing Everest - what did that involve? "I think there are two parts to that. You need to be experienced enough in climbing, you need to be used to altitude. You have to know basic climbing techniques. And second is your basic physical condition. So there was harsh training for about six months rather intensively, prior to the climb." When you actually did it, how difficult did you find the reality? "Very honestly, this was the hardest thing I've ever done in my life, both physically and psychologically it's very difficult. You spend almost two months on the mountain throughout the whole expedition, so it was tough." Did you ever have any particularly hairy moments, or moments when you thought, I want to go back, I can't take this any more? "I don't think there was a true crisis, because otherwise I don't think we would have made it. But throughout the whole expedition you have moments where you just think, I'm fed up, I'm tired, I want a proper bed, I miss my blanket. You have those moments and the important thing is to get over them." Tell us about the actual summit itself, when you reached the peak. "Summit day is pretty amazing. But to be honest you're so tired and really exhausted. And as they say, getting to the top is just half way - you also need to get down, which is the more difficult bit, to be honest. "We spent around half an hour on the summit. You look around and you're thinking, gosh, all those peaks I see are actually lower than where I am now, which feels great. "But it's pretty cold as well. It was about minus 30 up there and my hands were completely frozen at the time. I was just saying, God, we need to get down." Was it at night when you reached the peak of Mount Everest? "No, we actually started to climb in the evening. We started at 9 pm and climbed the whole night and reached the summit at 7 o'clock in the morning. Then it takes another six or eight, up to eight, hours to get down again to Camp Two, which is at a reasonable altitude and you can have a bit of a rest." I also read that you made a phone call from the peak of Everest, which certainly makes a change from "I'm on the train". Who did you call, and what did you say? "We had a satellite phone with us, so I made a quick phone call to my sister, saying, we're all right, we're still up there. But from what I understood when she spoke to me afterwards, she said actually it scared them quite a bit, because I didn't sound like I was having a great time up there. "So they were a bit worried and waiting for another eight hours before I called again saying I'm safe and down again." Did your fingers actually become frost-bitten? "I had a little bit of trouble with my fingers, that's true. You can still see it, but it's getting back to normal again. It wasn't too serious, but there are moments when the feeling in the tips of your fingers is gone." 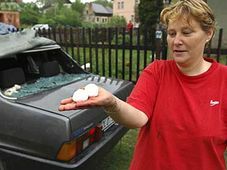 A couple of days after you the mayor of Prague, Pavel Bem, also reached the peak. Did you meet him at all on your trip? "Actually it was pretty close, because I got news from Prague via the satellite phone that it looked like he may be summiting on the same day. But he was climbing from the other side - I was climbing from the north face, the Tibetan side, and he was climbing the south face, from Nepal. "There was a tiny chance that we may meet on the summit, which would have been amazing, though I missed him by two days. But we met later in Katmandu, in a much nicer setting, in a small pub. We had a beer and that was great." You are the first Czech woman to ever reach the peak, but he is the mayor of Prague and was already well known - did he perhaps steal your thunder a little when he reached the peak just after you? "I don't think it's about stealing thunder and stuff. That's not why you climb. I think climbing is a very individual and personal experience in a way. The whole media coverage that has been created around it is just happening, but I don't care who's getting more or less coverage - that's not important." Also around that time a Czech climber died on Mount Everest, a man named Libor Kozak. Were you aware that he had died? "This is a very unfortunate...thing that happened on the mountain and that happens. I knew him, we met on the mountain and we spent an amazing three weeks together, and he was a really good friend. It's not easy to talk about it. "I learned the fact that he died up there the second day after we reached the summit, after we were getting down, and a member of another exhibition who was closer to him at the time told me that it had happened. It's very unfortunate." Generally speaking, what's the atmosphere like among climbers when you're at the base camp or half-way up the mountain, so to speak? "I think it's generally very friendly, to be honest. Everyone is there, everyone is suffering, everyone is sort of on the same way of trying to get ready and hopefully trying to summit at some point during their expedition. "When you're in the base camp it's a sort of small village where people meet. If you're not in the phase where you're actually climbing up there you have a lot of time to walk around other camps and talk to other expedition members. That's fantastic, it's really nice." I've read often and heard often that Everest these days can be quite crowded, and also that there's lots of rubbish around - is that true? "About the rubbish bit, no. That was a very pleasant surprise to be honest, because that's why I'd heard before as well. Now I think every expedition that goes up the mountain is very responsible in this respect and knows that whatever they bring with them they also take away when they leave." After this long and rather intense experience, did it take you long to get used to normalcy again, to normal life? And also I'm curious what did you most enjoy when you came back to civilisation? "The second bit is pretty easy! I think like every girl you like to...a bit of hygiene is lacking on the mountain, so the thing I was really, really looking forward to was my first shower. So after we got back to Katmandu and I got to the hotel and I think I spent an hour in the shower and I'm just like, this is great. "And getting back to the normal world again I think is part of the whole thing. For a while you're climbing and you can't escape...I need to get back to normal living, I missed my family, I miss my friends, and it's great to be in Prague in summer - so I think the entry is not too bad (laughs)." You've just moved back to Prague - what's next for Klara Polackova? "Next is to finally unpack! I still have backs all over that we moved from London - I didn't have time to do that. And maybe a little bit of traveling around the Czech Republic and maybe go down somewhere to the sea and just relax. "And towards the end of summer I think I'll be looking for another professional challenge, something new that I will enjoy work-wise."